This is the story of our life among the animals — but it is actually much more than that. Although the core of the story is about our sheep Genetics Programme and the advances we instituted in raising sheep, much of the book is devoted to building the ranch itself. We two, with a 9-year old son, built a two-storey, 2,400 sq ft log home in 29 days! Then came two large barns, grainaries, tack shop, 4-car garage/workshop, machine shed, horse barn/corral, and finally a very posh Guest House. It was challenging for two ex-Army novices; but also very exciting! For those many who visited us it will bring back memories: for those who didn’t, you’ll see what you missed. Please join us for a revisit. More than thirty-five years before I retired from the Canadian Army my then fiance, Daphne Holland, and I discussed our retirement plans. She had been raised on a huge cattle ranch in BC and wanted nothing more to do with cows. My family was Saskatchewan grain farmers and I knew that I didn’t want anything to do with growing grain — I had seen my Grandfather and Father suffer through the Great Depression! However, we were both quite committed to ‘returning to the land’ for our later years. And so it was, almost two years before my retirement, that we bought a small, 160-acre ranch in the Foothills of Alberta. We still had no idea what we wanted to raise, only that we wanted two riding horses. Beyond that we were quite content to let nature take its course. Nature, chance, fate — call it what you will — has a way of arranging one’s life quite independent of what one might have planned. Maybe it’s a part of the “Army Mentality”, but we had both become accustomed to living one day at a time and following the path that magically opened before us. Well written and quite interesting: it led to great conversations with a family who bought their lambs from the Moffats. I enjoy learning peoples’ histories; how things come about over time and how lives generally change over time. 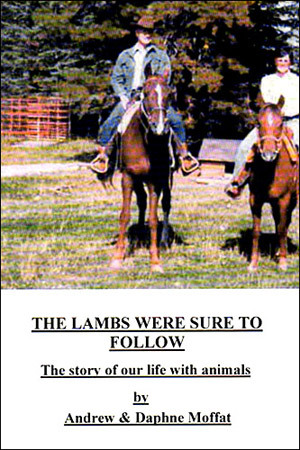 The book gave great insight into the ranch life and actually had us considering what we would do with our own retirement.